Ontario Fishing Directory - Lures and Tours Blog: Attention Anglers! 125 Team Limit Walleye Tourney Register Now! Attention Anglers! 125 Team Limit Walleye Tourney Register Now! 125 Team Limit! $10,000 Grand Prize Walleye Tournament! Register NOW! Ontario's oldest, original live release - Walleye Fishing Tournament returns! The Canada / U.S Walleye Tournament's 33rd Community-based event is organized by The Bobcaygeon and Area Chamber of Commerce. While official online and in-person registration begins Monday October 15, at 9:00 am, anglers can download and fill out their registration form NOW! Make sure you don't miss this event - bigger and better than last year ! Dan Risorto and Jeff Salazar were top prize winners of $5,000 in the 2012 as pictured below. Now, the 2013 Canada/US Walleye tournament is back bigger than ever with an amazing $10,000.00 first place prize money and cash awards down to 25th place. Since only 125 Teams will be admitted, there are no reservations - payment in full only - no partial deposits - it will fill up fast ! Get registered and get ready to take your best game to the water on May 24, 25 and 26, 2012 ! Don't be the one to say 'I didn't get registered in time'. 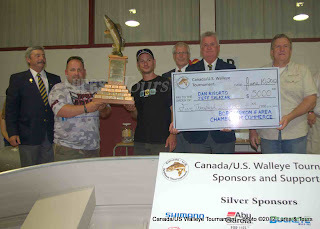 See more details and pictures from last year on the Lures & Tours Canada / U.S Walleye Tournament Page.